Thread by @SarahTaber_bww: "SO MUCH THIS Should we be worried about climate change? Absolutely. But I'd like us to be worried like a pilot in a plane with engine troubl […]"
Should we be worried about climate change? Absolutely. But I'd like us to be worried like a pilot in a plane with engine trouble is worried. There's so much we can DO. But not if we're busy screaming & flailing. How bout we buckle up & just land this damn plane. The "wandering herders create deserts" meme has little or no evidentiary backing. It's just what happens when sedentary Brits colonize nomadic areas, and need a just-so story to justify pushing their sedentary economic & political system on everyone else. There is a CORRELATION between growth of pastoralism & dryer climates. But correlation =/= causation. It's also quite possible that as climates got drier, people had to become more mobile to live with patchy resources. Which btw is how wild herds behave- not just domestic ones. How can we possibly know if nomadic herders were a CAUSE or an EFFECT of dryer climates? Turns out we can use climate modeling- the same techniques climate scientists have been using for years to understand human impacts on the climate. A group of scientists used the data we have on global climate conditions as the Sahara transitioned from humid plains- the Green Sahara period- to the desert it is today. Thanks to archaeology, we've known for a while that people living in the Sahara stopped living in villages and started traveling with their herds, around the same time that it became dry. This correlation- plus European empires' need to replace indigenous, mobile herding economies with their own sedentary farm-based ones- led to blaming herders for the Sahara desert. But when we use data? A very different picture emerges. Mobile herding was an innovative way for humans to survive environmental catastrophe. It was also more than that- when herds are always on the move, grasses have time to recover & regrow. It *prevents* desertification. "Overgrazing kills grass & creates bare dirt with a few scraggly shrubs" is a GROSS mischaracterization of how mobile herding works. You know what it does describe, though? When Europeans used to wet climates move to a desert & park their cows in one place for years on end. It also describes colonization. Much of the colonial process in arid areas involves forcing nomadic herders to STOP moving and stay in one place. THEN the grass dies. And the colonizers blame ... nomadic herding that isn't even happening anymore. Nice. Ancient cattle corrals in Kenya. 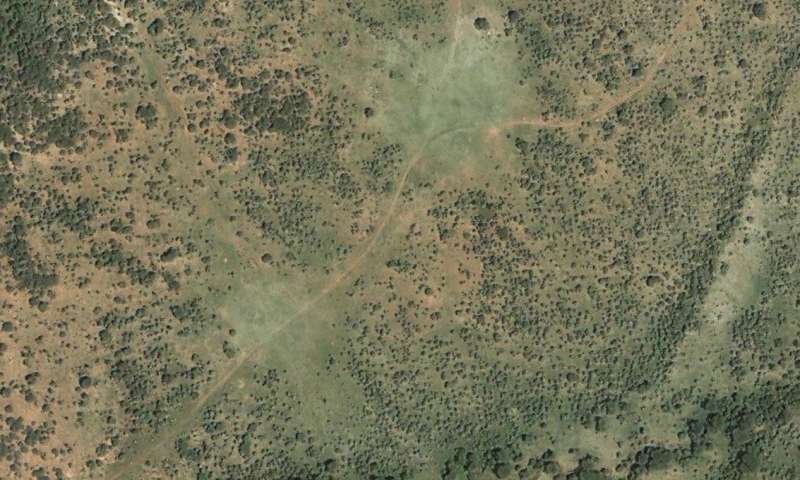 There were some places in Kenya with mysterious, oval-shaped patches in the plains. They're about 100meters across and have few scrub bushes, but lots & lots of lush grass that green up earlier & thicker than the surrounding areas. About 1-2 feet under the surface, these patches have a rich soil layer with elevated micronutrient levels. In them, grasses outcompete scrub. Migrating herds both find better food in these patches, & are less vulnerable to predators. These patches are the footprints of ancient cattle corrals from 2,000-3,000 years ago. These are where herders brought their animals overnight to protect them from predators. This pic is a modern Maasai corral, made & used much the same as they were thousands of years ago. To this day, migrating wildebeest & other wildlife seek out ancient corral footprints as they migrate. They eat & poop, cycling nutrients much faster than in surrounding areas. The soil is richer, more biodiverse, & holds more water btwn rains. This pushes yet MORE tender grass. There's a species of gecko that only lives in these hotspots. Hotspots that were created by nomadic herders going about their day-to-day life. "Our findings provide a new perspective on how human herding activities have influenced, and sometimes enriched, the ecology of African grasslands. 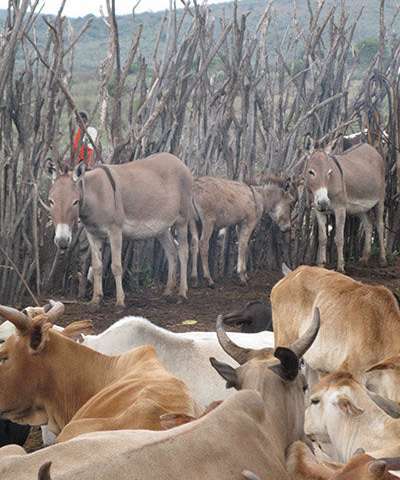 From a policy perspective, it suggests that there are ecological costs to increasing sedentization of herders." The environmental movement pushed this idea that all human activity is bad. It's not. We just have to be smart about what we're doing. Learn from what's worked in the past. Get ambitious about doing them now. And, you know, just maybe, can it with the colonialism.